I know it’s difficult being married to me. I won’t eat fast food, partially hydrogenated anything, red dye or any other Frankenfood. A box of chocolates will just send me into orbit because of the high fructose corn syrup and cut flowers leaves me cold. I did make a few itsy, bitsy requests of you last week. But really, Valentine’s Day is like my Superbowl, and I’m getting all excited about it. Darlin’ I want a dog. Yeah, I know, no dogs because puppies keep you up all night, pee all over the carpet and gnaw at the kids’ toys. Guess what? I can totally fix that. I want Jimmy! Jimmy is potty trained and little (doesn’t eat much), he’ll occupy the right side of my lap (I’ve got one for the left), he doesn’t shed AND I doubt he has many teeth left. I can’t help myself, I’m a poodle lover. 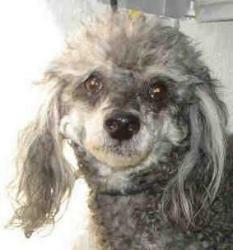 I’ve had 18 years of poodle and they’re smart and portable and just a little bit disagreeable (sound like me?). Unfortunately the good people who rescue dogs are quickly running out of funds. As the economy continues it’s downward spiral more and more pets are becoming homeless and rescues like The Bill Foundation are also low on funds. So darlin’ if you want to show me you love me on Valentine’s Day (and for many years to come) won’t you consider going to the adoption fair with me? It’s a family decision, and it would be a wonderful way to spend the day. P.S. If you aren’t in Los Angeles and you happen to be reading this Petfinder seems to be a great source for adoptable pets. I grew up with poodles too – two white toy poodles – Pinky and Pierre (don’t ask) and now my mother has two black toy poodles – Jett and Jazzy (again, don’t ask). They are the best dogs ever! Although my friend has a shipoo, a shitzu-poodle mix and he is pretty cute too. Jimmy *should* be at our “Have a Heart” adoption event this Sunday…just sayin’. 😉 His only problem is that he never wants to be put down. He’s sort of a softie that way.